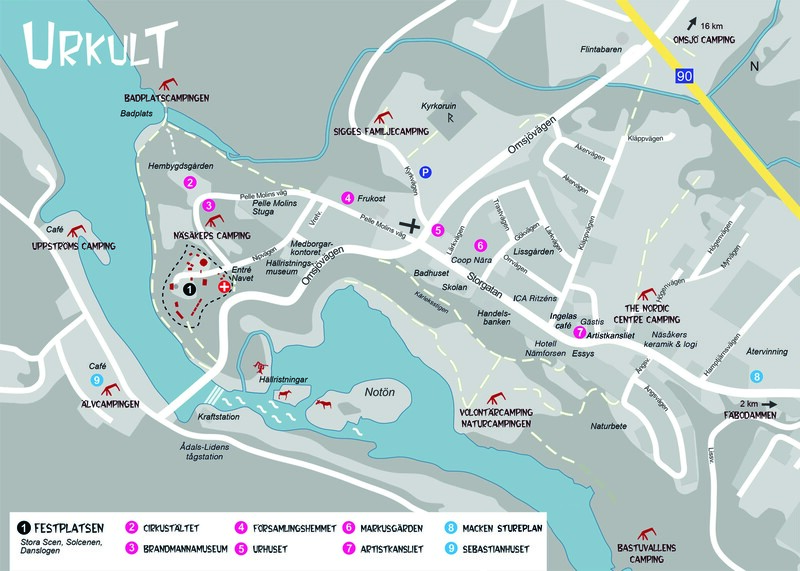 On this page we have tried to gather useful information that could be good to know before you visit Näsåker and Urkult. Click on the subject to see the answer! What can I eat at the festival? What do I need to know before entering the festival? Tickets can be bought here. We do sell a number of tickets at the entrance but to avoid queues you should buy in advance. Tickets can be collected at the ticket stall from Wednesday. The ticket purchase is binding. If you do regret your purchase you will have to re-sell it. Please contact Tickster support for more information. Biljettköpet är bindande. Tickets are usually released in December/January for buy early for the best deal, they will increase first of June again. Festival ticket – is valid Thursday to Saturday including Night of Fire. Night of fire ticket is valid on Thursday only. There are also a number of food stalls outside the festival closer to the village but we cannot guarantee that they have ecological food. Apart from stalls that are inside our own market street, we have high expectations on everyone that is inside <em>Urkults schyssta marknadsgata. Translated ” Urkults Fair Trade Street”. For groceries you can buy at Coop they have extended opening hours during the festival weekend. There is also ICA and the petrolstation offers a smaller range of necessities. Others are Ingelas café ( coffee, cakes, sandwiches and lighter food), Flintabaren (pizza and kebab) och Fäbodammen (a selected menu) this place is 15 km from Näsåker towards Sollefteå. Please look at our map to find out more. Unfortunately not. This is because all camp sites are run by private people. There are a number of different camping sites to book your camping at. Please find more information on our accommodation page. Most open their bookings in May/June and you will have to contact them yourself. We do not offer information about any vacancies. At Urkult we care for the environment. Therefore we ask you to please use the waste separation areas. You can also re-use your wine or beer glas or even the disposable cutleries. It is not allowed to bring any liquid inside everyone gets visited by our Urkult staff at the entrance please help them buy showing your bag or pur out the liquid in the liquid container. You can bring a bottle inside but not GLAS Bottles (we don’t want any glas stuck in bare feet’s). Right by the entrance you can fill your bottle with fresh water. To buy alcohol you have to be 18 +. We do not allow any dogs or other animals inside the festival area. If possible leave the dog at home. Inside the festival area we have a cash machine that will open on Friday. Some fo the market stalls do accept Swish or card payments. But most only accept cash. At Coop they will have a limited amount of cash to hand out and it’s usually difficult to get it from there. We recommend to bring what you need before you come to Näsåker. the closest cash point from here is at Ramsele 30km, or Sollefteå 42km. Urkult is situated at an ancient place, with steep slopes and tree roots poking up here and there. This makes the accessibility limited at some places. No it is prohibited to bring dogs inside the festival area. Please leave your dog at home if possible. If possible don’t bring you car to Näsåker. it is a small village and there is limited spaces for cars. You can park your car at the car park next to the church. It will cost 50 SEK per day. During the festival it is prohibited to park inside the village and along the roads. This is because we need to give way for Emergency staff. If you obey this you can be fined. Lost and found should be handed to the festival office at Markusgården or at the information stall inside the festival. After the festival we hand things like mobile phones, wallets, keys etc. to the police station. Everything else is held at Urhuset.